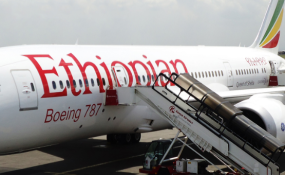 Ethiopian Airlines has emerged as the largest operator at the Entebbe International Airport, offering 140,000 outbound seats in the first quarter of 2018. Kenya Airways, which has five daily flights to Entebbe, saw its traffic in the first quarter of the year dip under 130,000 departing seats on a regional route that has become a cash cow for the Nairobi-based carrier. KQ also uses the Ugandan airport as its stop on some of its weekly rotations to Bangui in the Central African Republic. This is however expected to slow down following the entry of its subsidiary Jambojet, which began twice-daily flights to Entebbe from its Nairobi base. The OAG data also shows that the exit of British Airways from the route three years ago has left a gap that Middle Eastern carriers have taken advantage of, especially on the Entebbe-London route, which emerged as the most underserved. Uganda saw its last direct flight from London cancelled by British Airways in October 2015 citing "low passenger numbers," which made the route commercially unviable. The Entebbe route also lost Etihad in March this year, barely two and a half years after its entry to the route. The data shows that close to 60,000 passengers travelled between Entebbe and London in 2017, with most of them making connections via Dubai using Emirates (20 per cent), with Kenya Airways taking 19 per cent of the passenger load via its Nairobi connection. Currently, travellers from Entebbe to London have to depend on linkages either through Kigali, Nairobi or Addis for flights to the United Kingdom or use the Middle Eastern carriers that will either stopover in Dubai or Doha before connecting to London. The other options involve using Turkish Airlines, Brussels Airlines or KLM, with stopovers in Istanbul, Amsterdam or Brussels. Last month, it emerged that South African Airlines was in advanced discussions with Uganda to be granted fifth freedom rights for the Entebbe-London route, which would offer a direct connecting flight on this route. However, it will be an interesting development given that the Johannesburg-based carrier reduced its weekly frequency from seven to six between Jo'burg and Entebbe in September last year. "We have been in discussions with the Ugandan administration over direct flights to London from Entebbe and they have been very positive. We should see some results on this soon. This is part of our renewed focus on continental markets. The Ugandan government has been supportive, even fast-tracking some of the processes," SAA acting commercial general manager Aaron Munetsi said. Entebbe also lacks on a Mumbai connection, a gap that Kenya Airways and RwandAir have stepped in to fill. Air Tanzania, which in August started direct connection with Entebbe from its Dar es Salaam hub, is also planning to fly to Mumbai, in a bid to capture a share of their market.